This is one of my favorite places to photograph. I want to return there . . . tomorrow would be just fine. 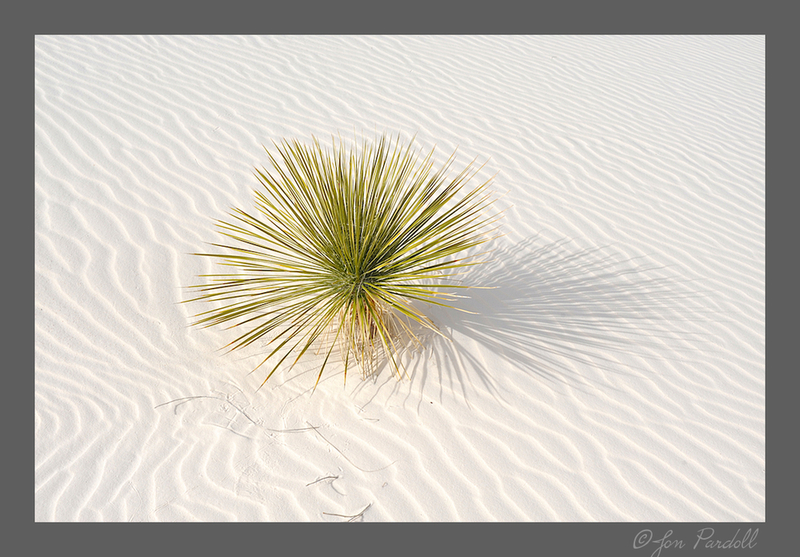 White Sands National Monument is located at the northern end of the Chihuahuan Desert in what is called the Tularosa Basin. It is surrounded by the White Sands Missile Range and is just down the road from Holloman Air Force Base. 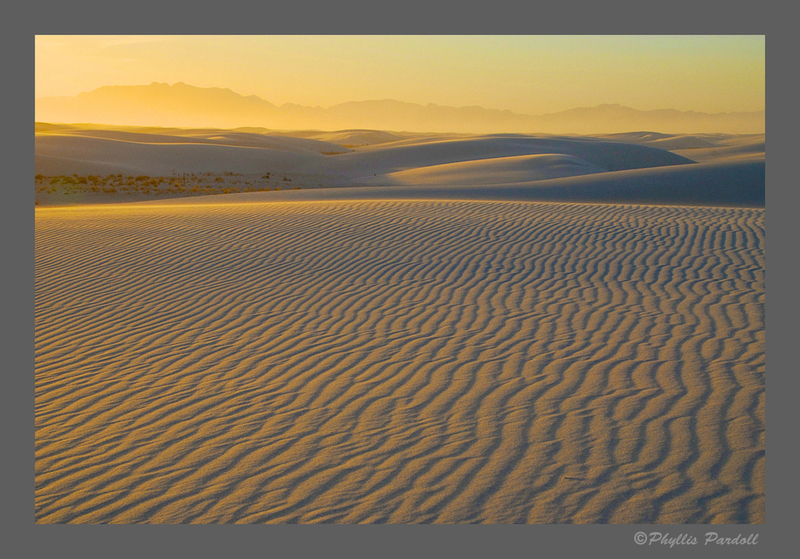 The gypsum dunes cover 275 square miles of desert and is the largest gypsum dune field in the world. It is a fascinating ecological story and I encourage you to check it out. Tom and I were joined on this short trip by Phyllis and Jon. As we approached the park entrance in late afternoon my heart sank. The wind was about 19 miles per hour and gusting to 25!! In a park that is all sand this is not good! We made the best of it while trying to protect our eyes, our gear and just hoping it would please stop. It did not. We had better weather the following morning but by late morning the wind had kicked back up so we left to check out two museums in the area (future blog entry). We did not return for an evening shot. One more try on the last morning was even more interesting photographically. The wind was not bad at about 3 to 5 miles but the sky was almost white from the wind of the last several days. 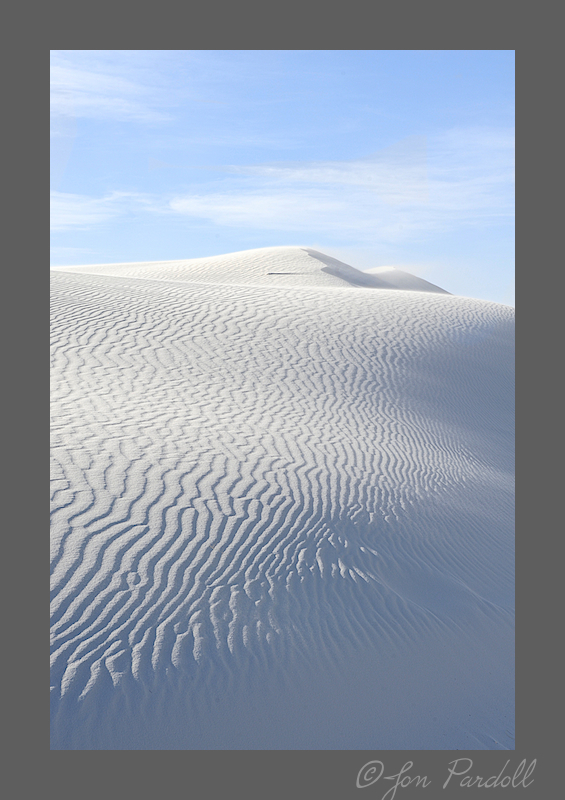 So, imagine white sand, white sky . . . better still, just enjoy the photos. 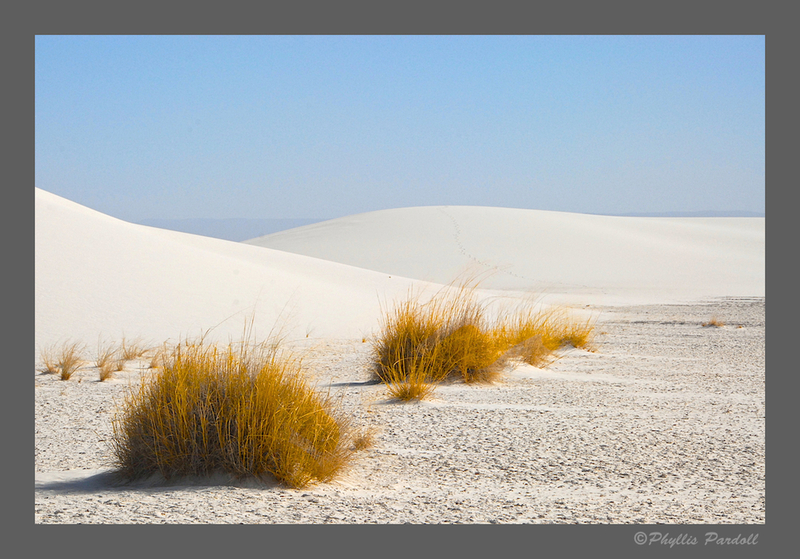 Phyllis will get you started by showing the effect of wind going over a dune ridge! ISO 500, f/16, 1/500, 0.67EV, at 170mm with Nikon D200 and 18-200mm Nikkor lens. ISO 400, f/13, 1/640, -0.67EV at 70mm with Nikon D700 and 28-70mm Nikkor lens. ISO 100, f/11, 1/200, -0.67EV, at 78mm with Nikon D800 and 24-120mm Nikkor lens. Processed in post with Nik Silver Efex Pro 2. ISO 320, f/22, at 15mm with Nikon D600 and 15mm Sigma fisheye. Processed in post as an HDR. Not surprisingly, the sunset was colorful but very different with all the sand in the air. 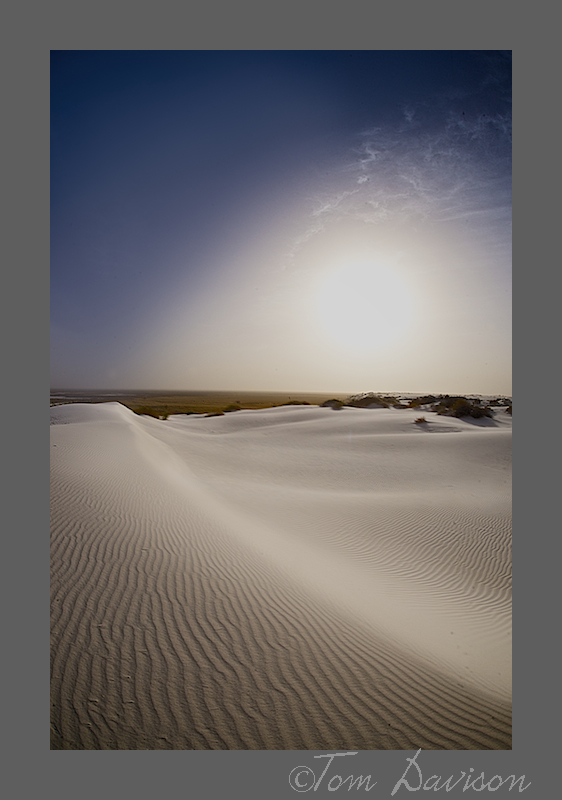 In some of the photos you can actually see the wind kicking up columns of airborne sand. ISO 400, f/8, 1/800, -0.67EV at 70mm with Nikon D800 and 24-120mm Nikkor lens. ISO 400, f/13, 1/640, -1EV at 52mm with Nikon D700 and 28-70mm Nikkor lens. ISO 500, f/11, 1/320 at 42mm with Nikon D200 and 18-200mm Nikkor lens. ISO 800, f/8, 1/50, -.67EV at 48mm with Nikon D800 and 24-120mm Nikkor lens. The next morning was more forgiving and there was even a bit of blue in the sky. Tom asked to be dropped off as he wanted to check out trees he had found in an earlier visit. 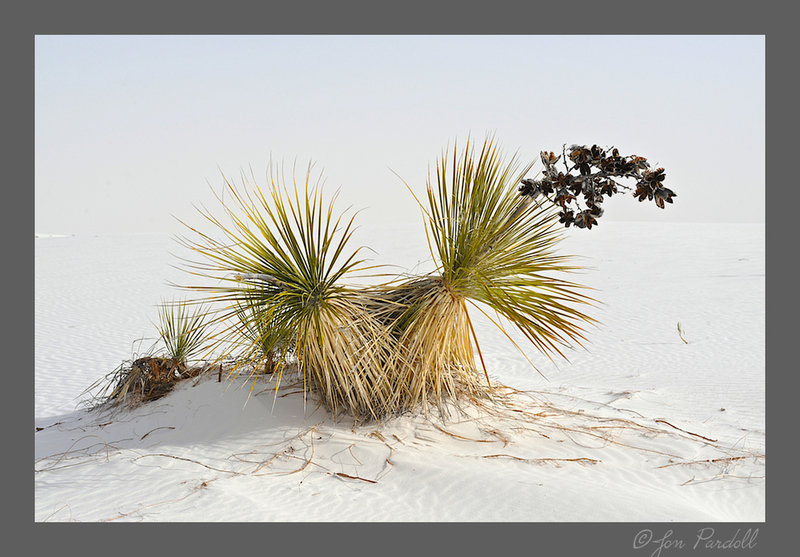 Trees are not abundant at White Sands and he hiked quite a ways to get his photos. The rest of us stayed closer to the road, enjoying photo opps along the way. ISO 400, f/11, 1/500, 0.33EV at 70mm with Nikon D700 and 28-70mm Nikkor lens. ISO 400, f/18, 1/500, -0.67EV at 86mm with Nikon D800 and 24-120mm Nikkor lens. ISO 500, f/16, 1/250, 1EV at 26mm with Nikon D600 and 24-70mm Nikkor lens. ISO 400, f/11, 1/800 at 170mm with Nikon D200 and 18-200mm Nikkor lens. ISO 320, f/22, 1/180 at 15mm with Nikon D600 and 15mm Sigma fisheye lens. Processed in post as an HDR. ISO 320, f/22, i/350 at 15mm with Nikon D600 and 15mm Sigma fisheye lens. Processed in post with Nik Silver Efex Pro 2. ISO 400, f/10, 1/400, 0.67EV at 31mm with Nikon D700 and 28-70mm Nikkor lens. ISO 200, f/13, 1/1000, -0.67EV at 78mm with Nikon D800 and 24-120mm Nikkor lens. ISO 200, f/13, 1/180, 1EV at 34mm with Nikon D600 and 24-70mm Nikkor lens. ISO 320, f/11, 1/750, 1EV at 15mm with Nikon D600 and 15mm Sigma fisheye lens. ISO 400, f/14, 1/320, 0.33EV at 75mm with Nikon D200 and 18-200mm Nikkor lens. Morning and late afternoon shadows and tracks are just exquisite on fresh sand. I have no idea who leaves tracks such as these. ISO 400, f/13, 1/640 at 42mm with Nikon D700 and 28-70mm Nikkor lens. ISO 400, f/10, 1/640 at 50mm with Nikon D800 and 24-120mm Nikkor lens. Processed in post with Nik Silver Efex Pro 2 using Underexposed EV-1 and selection of Fuji Neopan ACROS 100 as film treatment. We gave up on the dunes before noon, had lunch in Alamagordo and then went to the Missile Museum and the Space Museum. Imagine our surprise the following morning when we awoke to a most unusual sky. ISO 500, f/11, 1/500, 0.33 EV at 200mm with Nikon D200 and 18-200mm Nikkor lens. ISO 100, f/11, 1/320, -0.67EV at 100mm with Nikon D800 and 24-120mm Nikkor lens. ISO 320, f/22 at 15mm with Nikon D600 and 15mm Sigma fisheye. Processed in post as an HDR and then in Nik Silver Efex Pro 2. ISO 400, f/11, 1/500, 0.67EV at 120mm with Nikon D200 and 18-200 Nikkor lens. In case you were wondering, the circles are made by the grass moving back and forth in the wind. ISO 320, f/22, 1/180, 1EV at 32mm with Nikon D600 and 24-70mm Nikkor lens. ISO 400, f/11, 1/500, at 70mm with Nikon D700 and 28-70mm Nikkor lens. ISO 400, f/13, 1/640 at 60mm with Nikon D700 and 28-70mm Nikkor lens. When nature deals you a 'white out' deal with it!! Creatively, please. ISO 640, f/14, 1/500, 0.33EV at 135mm with Nikon D200 and 18-200 Nikkor lens. ISO 640, f/14, 1/500, 0.33EV at 105mm with Nikon D200 and 18-200mm Nikkor lens. The dune ecosystem feels extremely inhospitable. But, there are picnic areas with interesting protective 'back' covers built in, the back protecting people from the usual prevailing wind. There are 'outhouses' built next to parking areas. ISO 100, f/8, 1/800, -0.67EV at 38mm with Nikon D800 and 24-120mm Nikkor lens. ISO 100, f/8, 1/800, -0.67EV at 112mm with Nikon D800 and 24-120mm Nikkor lens. Finally, it is difficult to demonstrate scale in this environment. But, here is my try. That is Jon, headed back to the car. And yes, those are my footprints leaving the indentations in the sand. 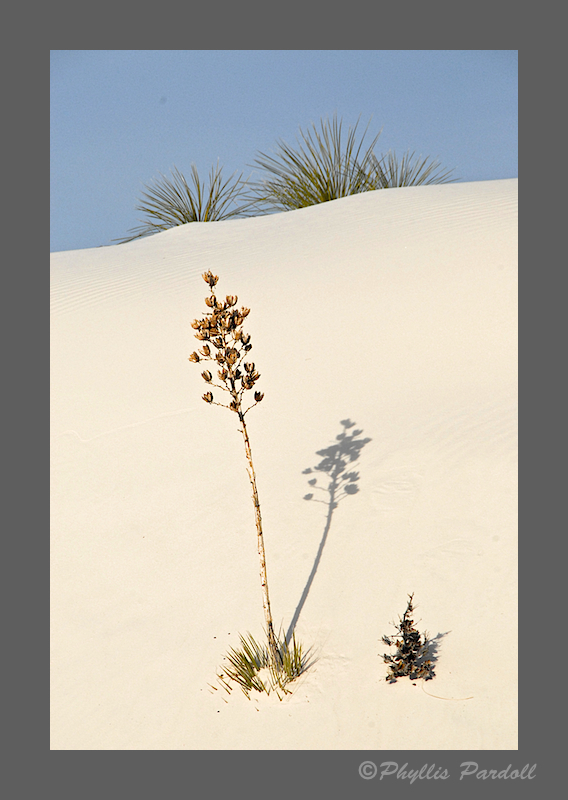 It is not easy to climb sand dunes. We will, of course, go back to White Sands. We suspect that the Sand Verbena will be blooming in May. Hope you enjoyed the photos.